Haddock is a fish of the family Gadidae. Properly cooked it is very tasty. Cooking with it can be absolutely any food, including dumplings and cakes. 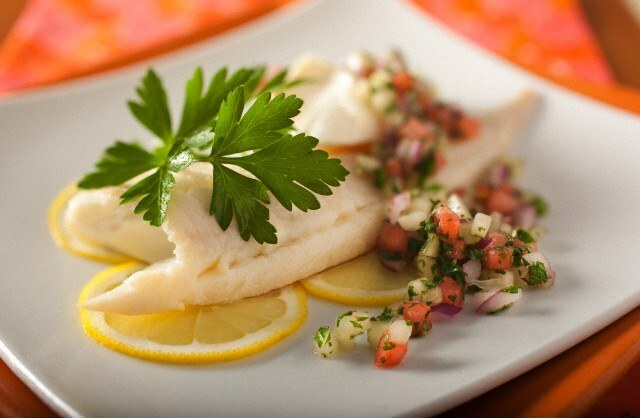 But, of course, the best option is to bake the fish in the oven with onions, tomatoes and eggplant or an ear. - salt, black pepper and rosemary to taste. Cooking baked haddock should start with unfreezing her carcass and cleaning of scales. You also need to cut off the fins of the fish. Then wash haddock in cool water, RUB it with rosemary and salt, sprinkle with juice from a quarter lemon. In the abdomen to tuck sprigs of herbs – cilantro and dill. Then you can move on to preparing the vegetables. Peel the onion, cut it into thick half rings, to send for 3-5 minutes in a pan with heated olive oil. Add to it the peeled and chopped large pieces of eggplant, and a little later tomato. Sauté the vegetables for another 5 minutes on low heat. After they will give juice, and cook for another 5 minutes, but the fire has to be increased. The baking pan should be lubricated with oil, just palm or using a cooking brush. To put it haddock with vegetables. Oven preheat to 200 degrees, put in his form of fish. About 5 minutes until cooked meals must sprinkle with fine grated cheese. That's all, the fish is ready. Haddock baked in the oven turns out very tasty and useful. Her happy to eat both adults and children. In advance in salted water boil the potatoes, cool it and cut into small cubes. Carcass haddock, cleaned, cut up, divided into small pieces. Then in a pan pour milk, place it on the fire. Salt them a bit. When the liquid starts to boil, it should be put in her fish, and after 5-7 minutes, add the potatoes. Onion cut into small rings and fry in butter until Golden brown, send it in the pan literally 3 minutes before end of cooking. Ear ready to pour on plates, each of which, if you want, put a piece of butter and chopped parsley.